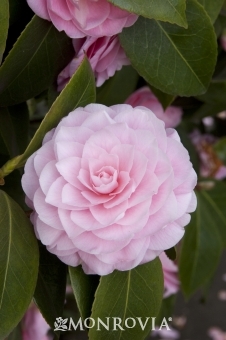 Spectacular, soft, shell pink, formal double blooms in mid to late winter. Flowers make a dazzling contrast with the glossy, dark green foliage. A prized plant of the milder regions of the U.S. Mid to late season bloomer. Evergreen.